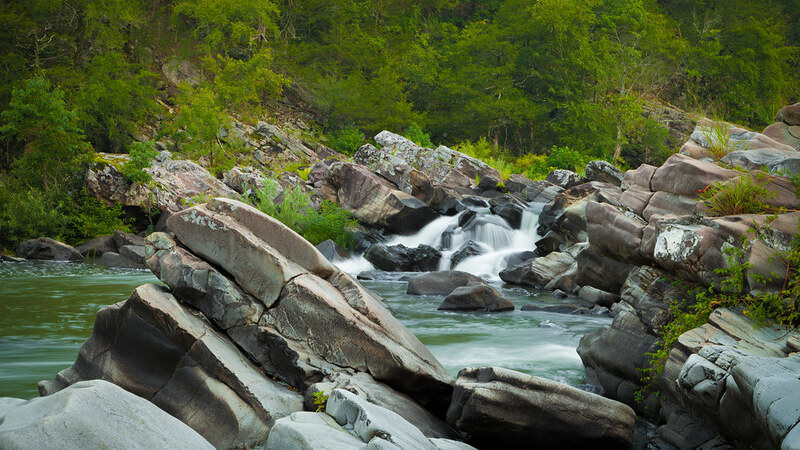 The park, managed jointly by Arkansas State Parks and the Arkansas Natural Heritage Commission, includes 12.5 miles of one of the most rugged and spectacular river corridors in the central United States. With over 5,483 acres of rugged wooded slopes, outstanding geological features, cascading clear water and Class III, IV and even Class V rapids, the Cossatot is a favorite with skilled canoeists, rafters and kayakers. The combination of natural vegetation, rugged topography, exposed rock formations, and sparkling water creates a scenic extravaganza. The mission of CRSPNA is to maintain the natural and scenic quality of the Cossatot River corridor and provide natural resource education opportunities. Two park interpreters are on staff year-round to provide programs for our visitors and curriculum-based education experiences for school groups. The leopard darter and the Ouachita Mountain shiner, found only in the southern Ouachitas, live in the river. Waterfall’s sedge and Ouachita Mountain twistflower, found only in a few counties in the Ouachita Mountains, and a number of other sensitive species thrive within the park’s five natural communities. The Cossatot river truly is a wondrous place and a haven for paddlers. With a 31 foot drop over a 1/3 of a mile, it gives the adventurers out there a place to try their skill against some of the most treacherous whitewater in Arkansas. After all, Cossatot means “Skullcrusher” in the native tongue. For photographers it’s a place to practice your skill at slowing down a great deal of moving water and producing a beautiful photograph of a rocky waterscape. I’m quite happy with this photograph I captured of this beautiful river in the summer of 2012.